As seen from Earth, only transits of the inner planets Mercury and Venus are possible. Planetary transits are far more rare than eclipses of the Sun by the Moon. On average, there are 13 transits of Mercury each century. Nowadays, all transits of Mercury fall within several days of May 8 and November 10. 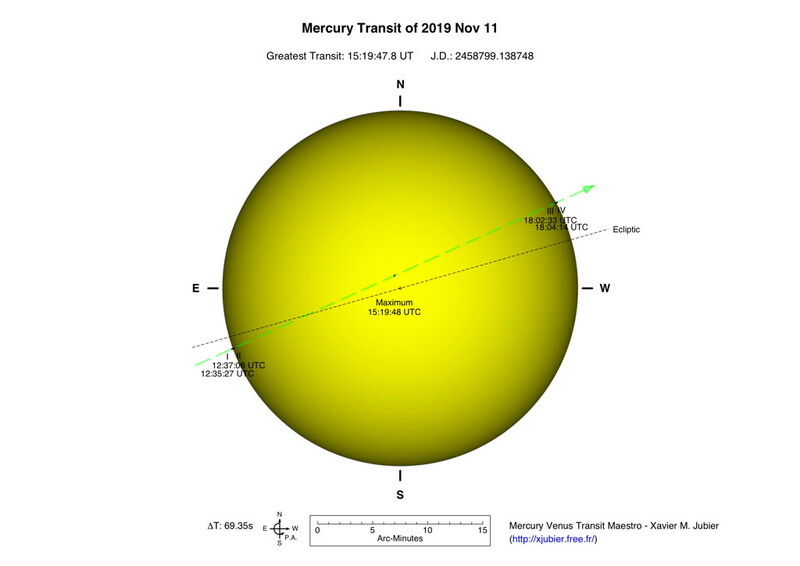 During November transits, Mercury is near perihelion and exhibits a disk only 10 arc-seconds in diameter. By comparison, the planet is near aphelion during May transits and appears 12 arc-seconds across. However be aware that the planet Mercury is too small to be seen with the naked eye in front of the Sun. It’s therefore essential to magnify the image using a telescope or any appropriate device to detect the black ball pinned in the foreground of the photosphere of our star. 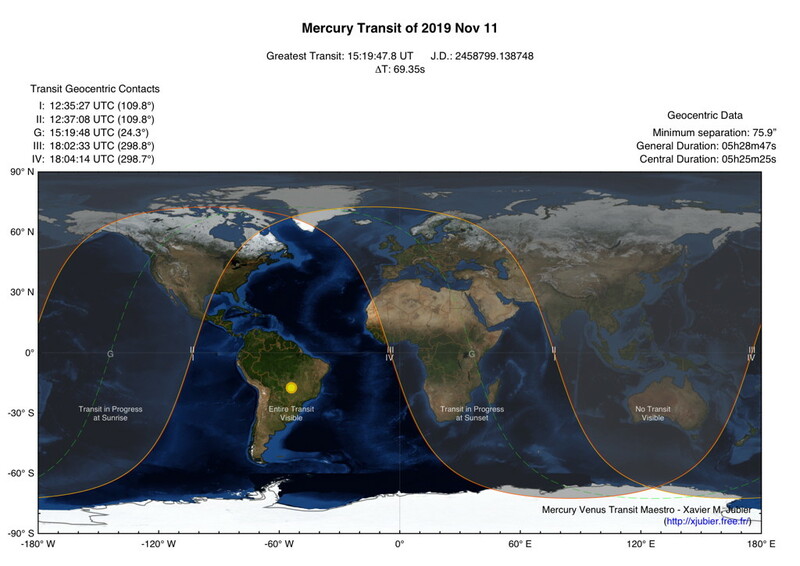 On the 2019 Transit of Mercury visibility map you can see that all the transit is visible from the Atacama desert in northern Chile and western Africa where the weather prospects are the best in November. 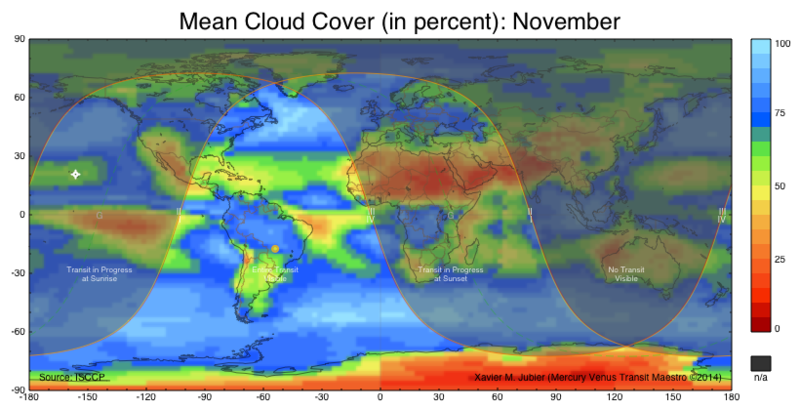 This is why I will likely observe from the Canary Islands or else from the Atacama desert in northern Chile. In about five and a half hours time the planet Mercury will cross the solar disk from east to west. It will be the first transit of Mercury since the previous one in 2016 and will be visible from the Americas, Africa and Europe. The next Mercury transit will only occur in 2032, so don’t miss the 2019 one! Find out if you will be able to see Mercury during the next November transit by using this Mercury transit calculator. Page "Description" | Page "Google Map"
Last page update on September 10, 2016.